Mankind has been harnessing the power of water for centuries, for spinning yarn, weaving cloth, for processing iron or lead and that most primitive of industries, grinding grain into flour. 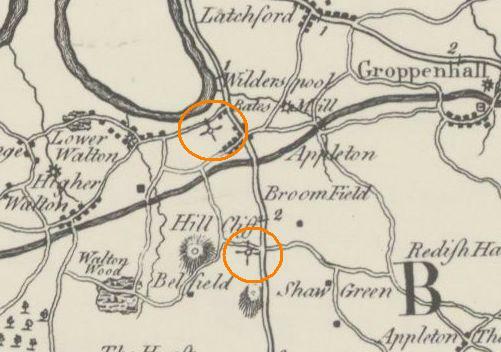 The site of any such mill is a mystery, though it is interesting to note on the Tithe Map of 1848, the names of two fields, “Big Mill Field” and “Little Mill Field”, which do not appear to relate to the site of Colthurst Mill further upstream. 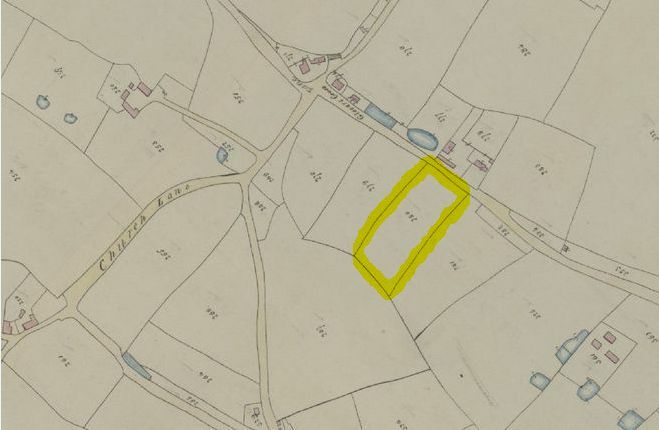 Another interesting but perhaps obscure reference to a mill in Marthall appears in the form of a field named “Mill Stone Meadow” to the southeast of Marthall crossroads. 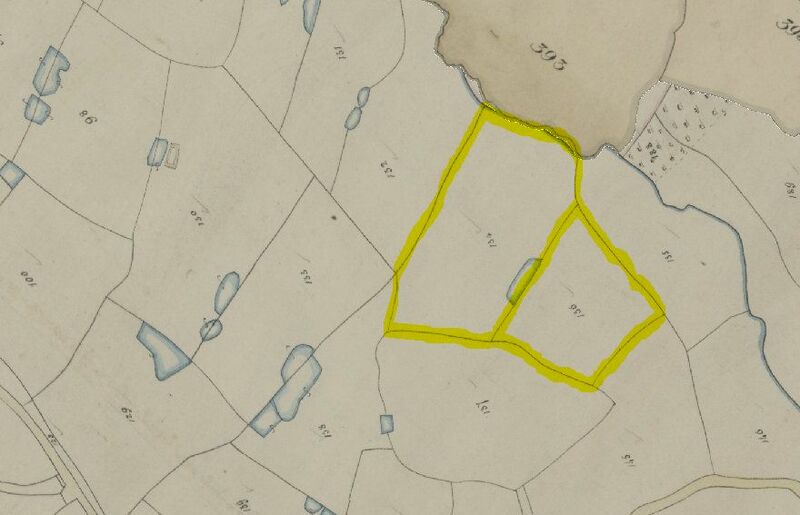 This name appears on the Tithe Map of 1848, but not on any later maps, not is there any indication of a mill building. In the present day however, this site is occupied by an agricultural site known as Marthall Mill, but the history of this is unknown. A particularly interesting discovery has been evidence of the existence of a windmill in the area. This reads as if the windmill was gone by the time this survey was carried out. Warford Heath Lanes are the area around present day Ancoats Lane up to Knutsford Road. 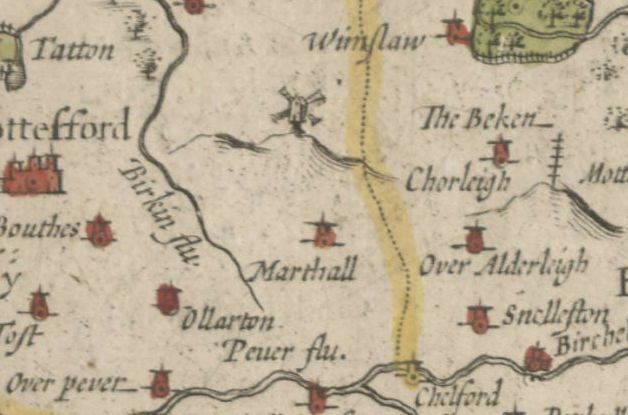 Oliver Bott made reference to the site in his essay on corn mill sites in Cheshire 1066-1850, after finding it on several old maps, but was unable to discover any other information. 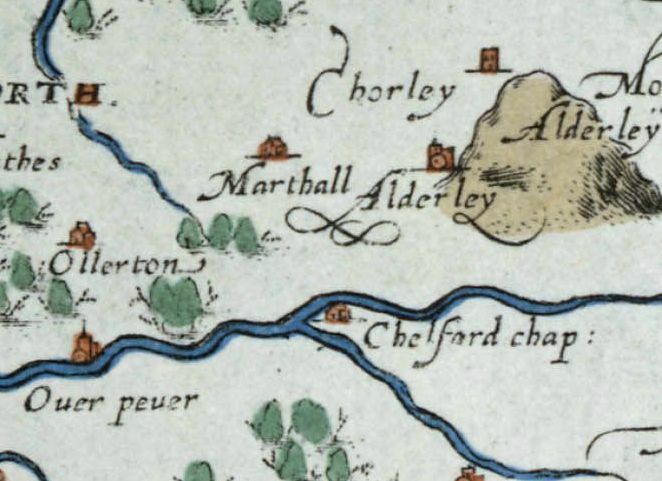 An earlier map of 1577 does not show it, so it may be that it was built between these dates, but maps such as these can never be guaranteed as geographically or factually accurate. Taking into account the lack of scale on these maps, it is thought that this roughly refers to the area around Springfield Farm. 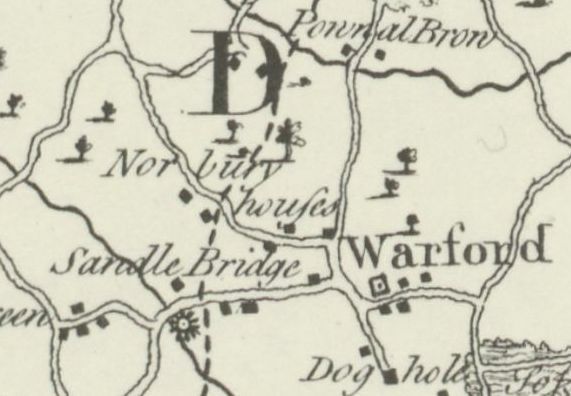 Looking at the key of this map, the icon for a windmill was drawn in a different way, as shown by these two contemporary examples near Warrington, so it is unclear why the windmill at Warford had its own artistic design. Could it have been in a state of disrepair, or perhaps it was a much larger example? 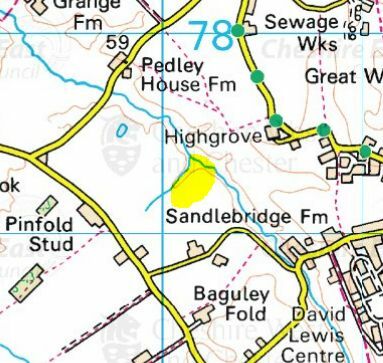 Presumably, any mill in the vicinity would have been situated on Pedley Brook. 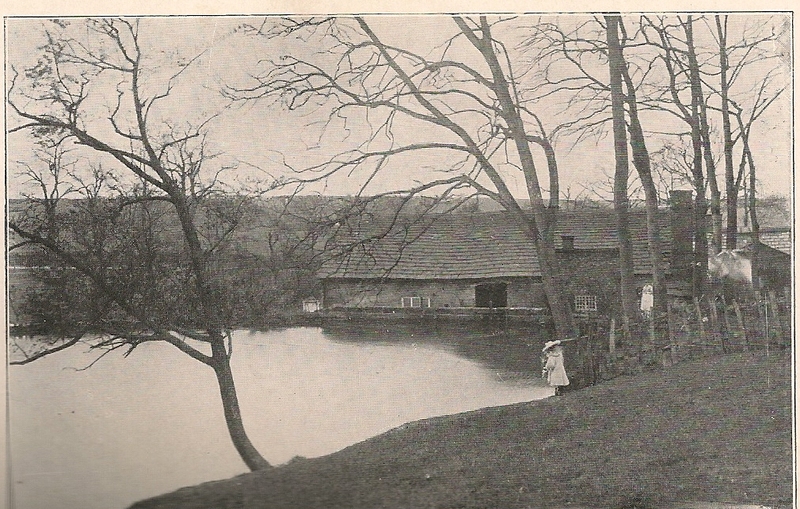 The name “Peck Mill” may refer to a type of mill with a pecking movement or to the capacity of the grindstones, ie. a peck measure. “Starting at the Monks Abbey Mill, (where Abbey Farm is now) in the 12th century, on the main road from Chelford to Macclesfield, then down some hollow flag stones, which had been made hollow by the horses shoes. They are now covered over with soil. 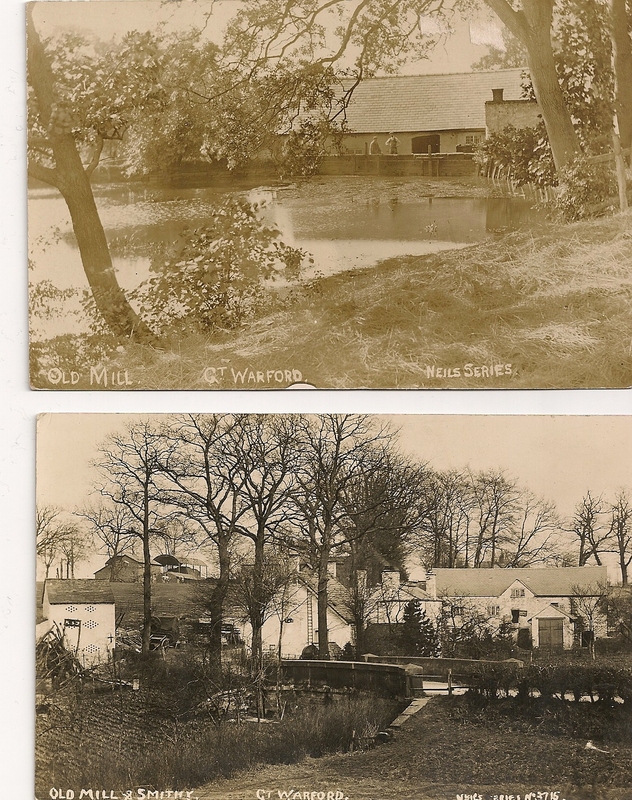 Then to Peck Mill, then to a very old house on the top of the bank, once the home of the Cooper family. (I saw it burn down). Then to near Kell Green Hall, Marthall then on to the borders of Ollerton to Spring Wood Mill. This had been built by the Legh family of Booth Hall, and was demolished when they built the Booth Mill on the Mobberley Road. 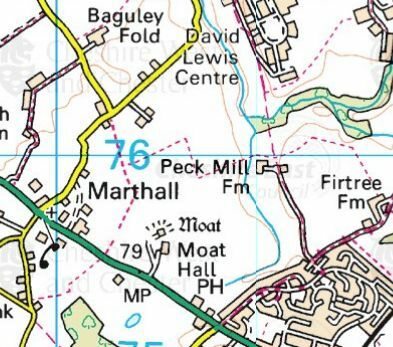 Information about Peck Mill Farm, can be found in the Farms area of the website. By far the most well documented mill in the area was Colthurst Mill, sadly demolished in the 1960’s. This is roughly where the United Utilities water station is, at the Sandlebridge end of Mill Lane. “Colthurst Mill was only a few yards away from Dales House. It formerly had a heavy flag roof, and the Drying Kiln on the roadside originally had a thatched roof, but in my young days it was re-roofed with slates. There were two very big waterwheels , side by side, one was over-flow, and the other under-flow. I presume the one on the far side came from the old Peck Mill further up the stream and was put here in 1567, as that date was scored on some timber near to it. The water previously came from the old Alderley Mill, now a National Trust Mill. I have seen the old Drying Kiln working several times, and in the underneath chamber , the fire place, there were a number of inscriptions and dates on some of the stones and woodwork. This end of the mill was the oldest and has started to subside. Even the floor in the living room in the dwelling house sloped to one side. The Rawlins family lived here and were Millers here for many years, and when they left, they went to Old Alderley Mill. 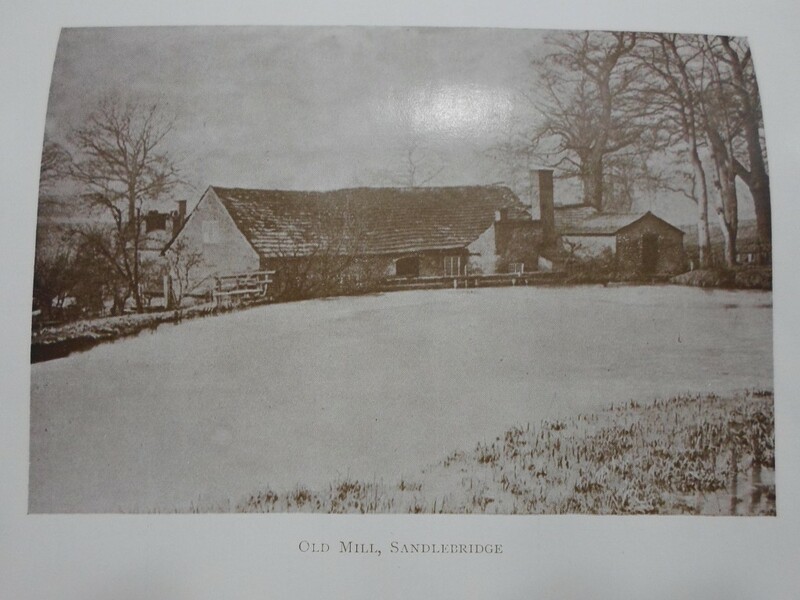 Sandlebridge came into the possession of the Holland family through Samuel Holland’s wife, Ann Colthurst.